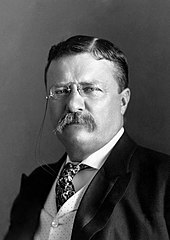 Roosevelt took the office in September 1901 following the assassination of his predecessor , William McKinley. 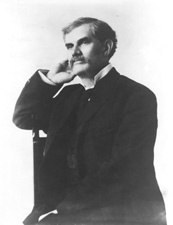 After the February 1904 death of McKinley's ally, Senator Mark Hanna, Roosevelt faced little opposition at the 1904 Republican National Convention. 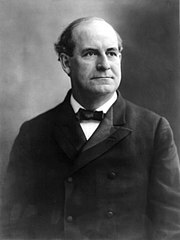 The conservative Bourbon Democrat allies of former President Grover Cleveland temporarily regained control of the Democratic Party from the followers of William Jennings Bryan, and the 1904 Democratic National Convention nominated Alton B. Parker, Chief Judge of the New York Court of Appeals. 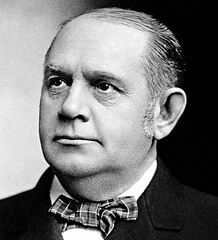 Parker triumphed on the second ballot of the convention, defeating newspaper magnate William Randolph Hearst. As there was little difference between the candidates' positions, the race was largely based on their personalities; the Democrats argued the Roosevelt presidency was "arbitrary" and "erratic." 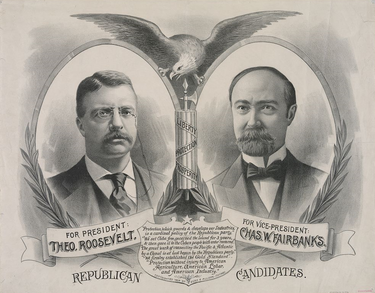 Republicans emphasized Roosevelt's success in foreign affairs and his record of firmness against monopolies. Roosevelt easily defeated Parker, sweeping every region in the nation except the South. Two third-party candidates, Eugene V. Debs of the Socialist Party and Silas C. Swallow of the Prohibition Party, each took over 1% of the popular vote. Roosevelt's popular vote margin of 18.8% was the largest since James Monroe's victory in the 1820 presidential election. ^ "Official report of the proceedings of the Democratic national convention". Kdl.kyvl.org. p. 277. Archived from the original on January 13, 2013. Retrieved August 18, 2016. ^ "Official report of the proceedings of the Democratic national convention],". Kdl.kyvl.org. p. 278. Archived from the original on January 13, 2013. Retrieved August 18, 2016. ^ "The Bowery Boys: New York City History". Theboweryboys.blogspot.com. Retrieved August 18, 2016. 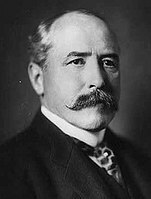 ^ "Too Close to Call: Presidential Electors and Elections in Maryland featuring the Presidential Election of 1904". Msa.maryland.gov. Retrieved August 18, 2016.